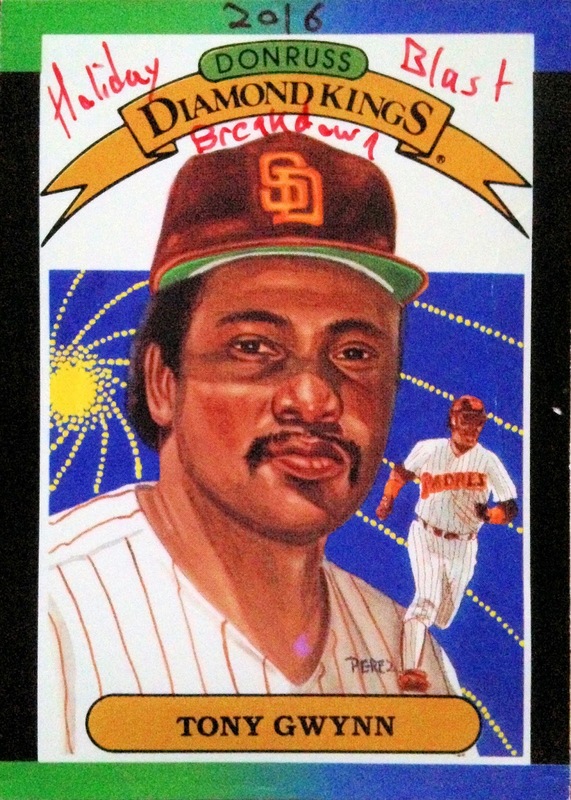 Gavin, of Baseball Card Breakdown notoriety, and his Christmas mailings are quickly becoming the stuff of legends. 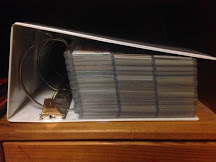 Last year, his "LaMarr-y Chrstmas" ornaments broke the blogosphere and the cards he included with them weren't so bad either. On a related note, surely, by now, you've seen his skills with custom cards; the man should be on Topps payroll, just sayin'. Well, this year, he really took it up a notch with his now-annual Holiday mailings... something that I fully wasn't prepared for. On a day when all of the packages in the world showed up on my doorstep and the UPS man probably threw out his back carrying them all, it was Gavin's plain white envelope was the star of the day, outshining all of the Christmas gifts, bachelorette party supplies and Advocare check. It was that good. It takes an exceptional mailing for a fan-favorite, red refractor (nee Prizm) to be the least-interesting card of the bunch. 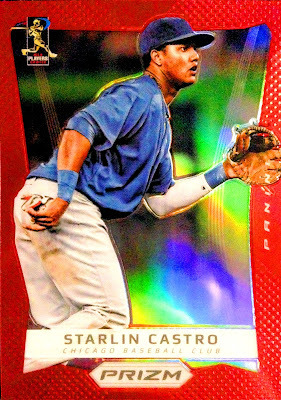 That is to say, on any other day, this 2013 PRIZM single might have been one of the highest of the highlights. 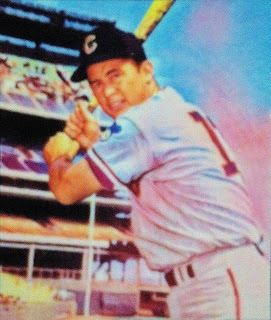 After all, with red being the secondary color for the Cubs, red parallels usually work quite well with Northsider cards. As it stands, today it's the opening act. Next up, we shift gears a little bit with another parallel, but from a different sport. Shane Carden never did suit up with the Bears, but this spiffy blue parallel, numbered /99, from 2015 Score will still look sharp in my Bears collection. 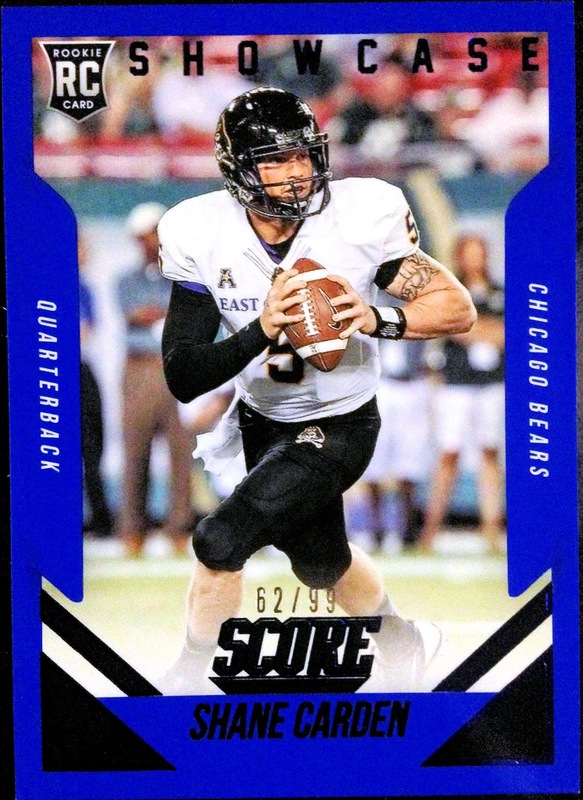 In case you were wondering, the former East Carolina signal caller has been suiting up with the Montreal Allouettes this season. 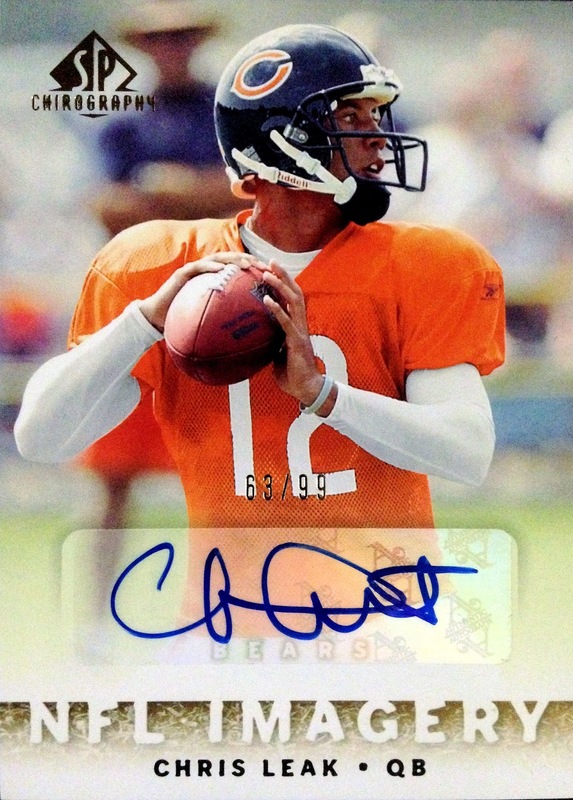 Next to Mr. Carden, we have another QB who never made it out of the pre-season with the Monsters of the Midway. However, this 2007 Chris Leak SP Chirography autograph (also numbered /99) represents my very first football autograph card. That's good for some major bonus points! Annnnndddd it didn't take long for my second Bears autograph to show up. 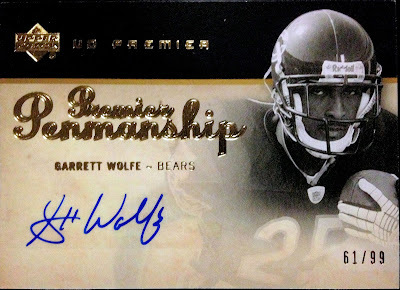 This one is especially significant to me, as I was introduced to Garrett Wolfe (and Greg Olsen) the year they were drafted (2008) at the JP Morgan Corporate Challenge 5k race in downtown Chicago, but I was too starstruck to ask for their John Hancocks. Thank you, Gavin, for rectifying my stage fright-induced missed opportunity. 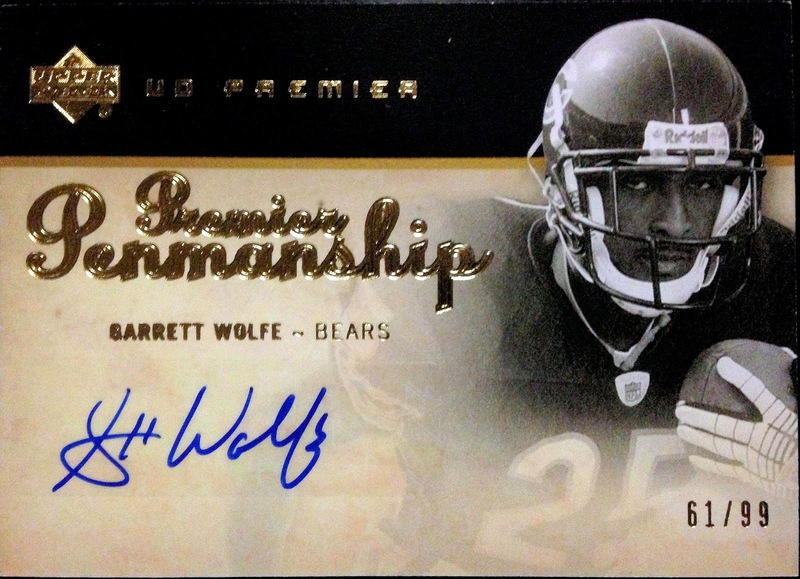 Also, this UD Premier, Premier Penmanship signature is numbered to, you guessed it, 99. I guess that's the number of the day. This is the point in opening the envelope where I nearly fell over. These exclusive oddballs were given away by the USD Torerros at the MLB All-Star Game Fanfest this past summer and the first time I saw one of these pop up on the internet, I started drooling. 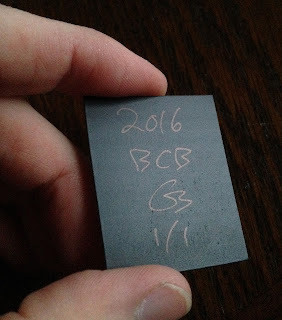 Seeing as the event was hosted in San Diego this year, I guess Gavin had the hookup for multiples of this little number, seeing as he's a Bryant collector himself. 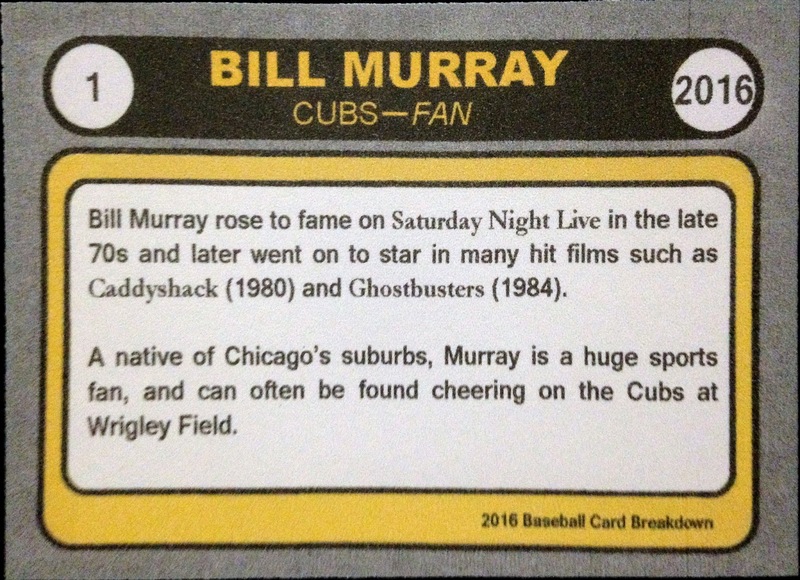 Hot damn - this regional oddity will look swell in my collection of non-MLB Cubs cards, which I call my Nothing Major binder. 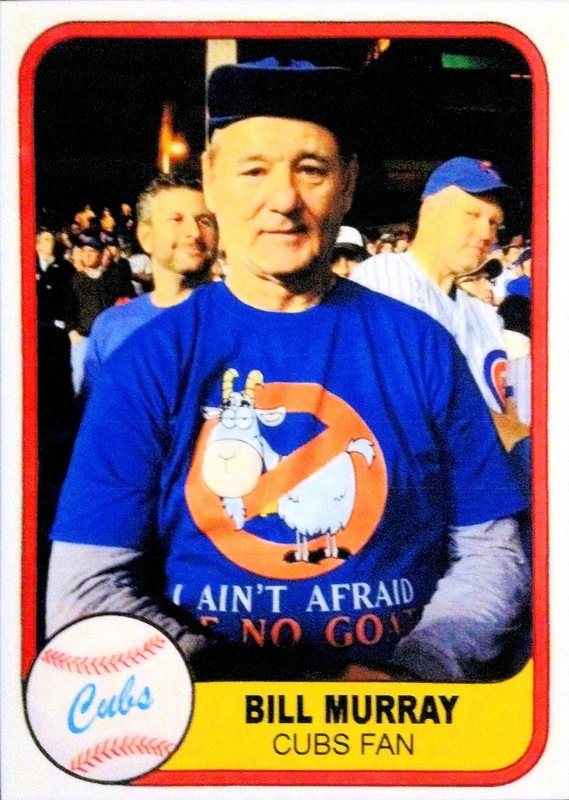 The man, the myth, the legend - tell me, who doesn't love Bill freakin' Murray. 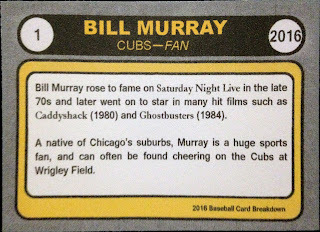 I'm fairly sure that it's written into Illinois law that disliking the Ghostbuster, greenskeeper, zombie survivor, Groundhogs day re-liver, Scrooge stand-in, SNL alum is expressly forbidden. The native Chicagoan also just so happens to be a baseball fanatic and his team of choice is the Cubs. Amazingly, Mr. Murray has not showed up in Cubs gear on an actual card yet, at least until Gavin decided to fix this unjust slight with these two customs; spot on, perfect recreations of 1981 Feer and 1988 Score. Gavin also went so far as to perfectly recreate to backs of these designs with in-depth and informative write ups. I was exceptionally delighted to see that Gavin mentioned Bill's brief stint as an actual, uniformed pro baseball player. 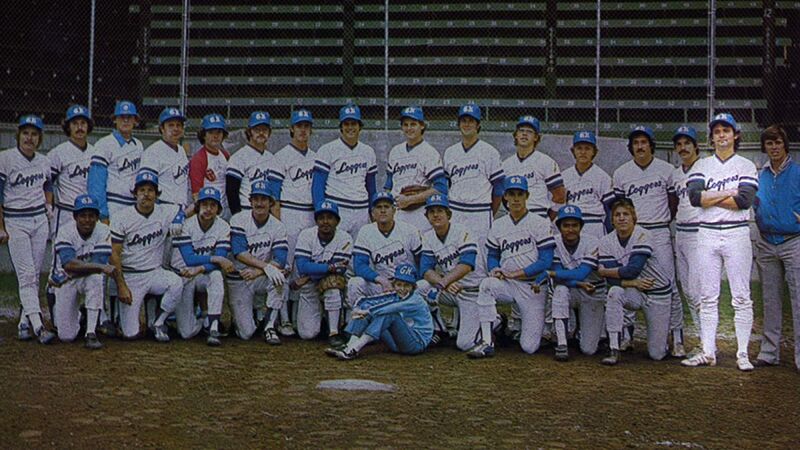 That's right, in 1978, William took two at-bats with the independent Grays Harbor Loggers as part of an SNL production. Don't believe me? 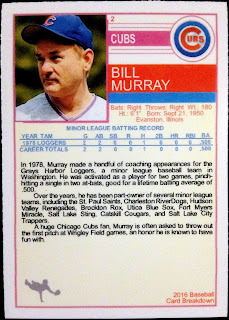 He even has a Baseball Reference entry. Eat your heart out, Will Ferrell! Gavin brings both design skills AND knowledge to the table with his expertly crafted customs. Speaking of customs, I believe this is a card blog first - a custom rip card, using a pair of junk wax Tony Gwynn's My "2016 Holiday Blast Breakdown" ripper is #2/25. The question of whether to rip or not to rip was made easy for me, as my carelessness led to some paper loss on the front. Clumsy me. What curiosities did the inside of this card of wonders contain within? The suspense was killing me. WOOT!!! 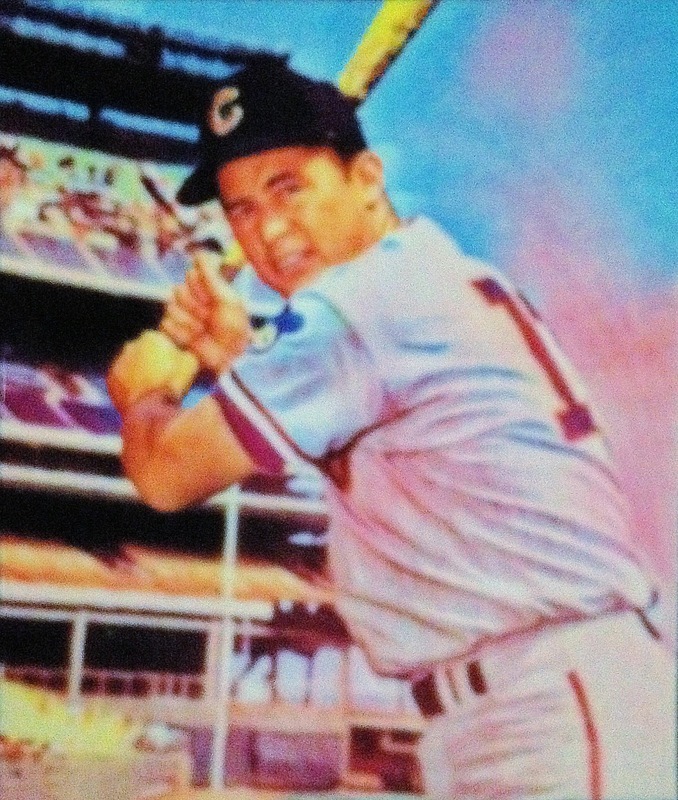 A hand-made, Ron Santo magnet. 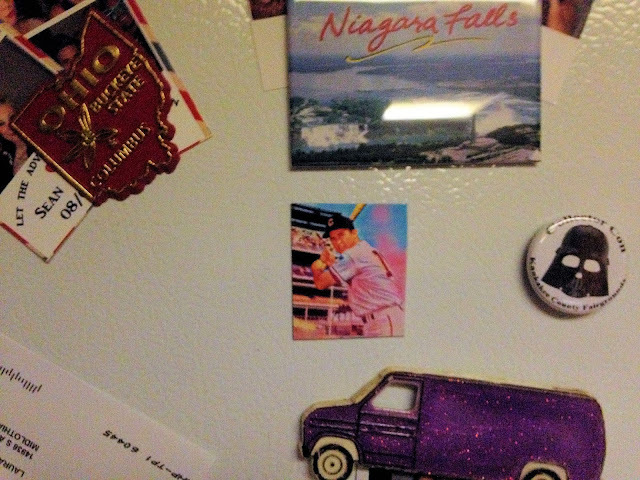 My favorite Cubs player of all-time on a one-of-a-kind, refrigerator decoration? 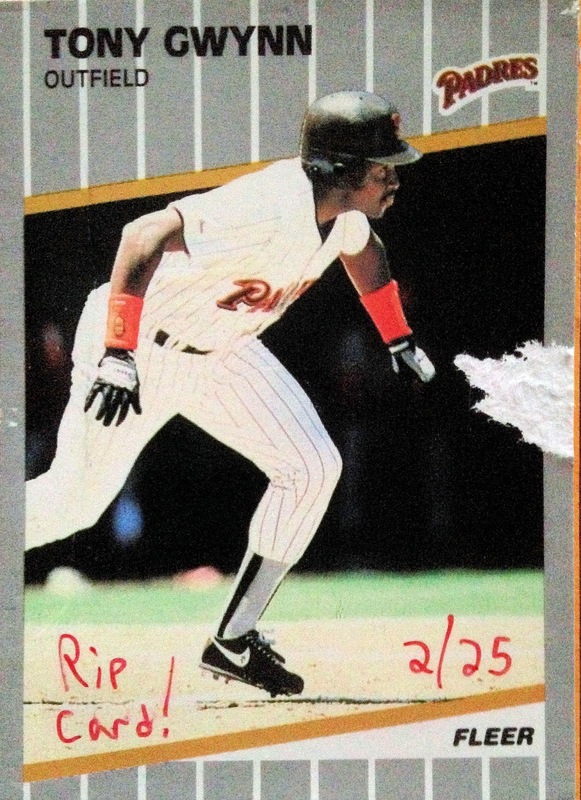 This rip card could not have worked out any better for me. See? it's truly is a 1/1. With the artist's signature to boot. Boom goes the dynamite! See? Definitely the best magnet. Gavin - thank you a million times over for the overly-generous, "Holiday Blast" mailing. 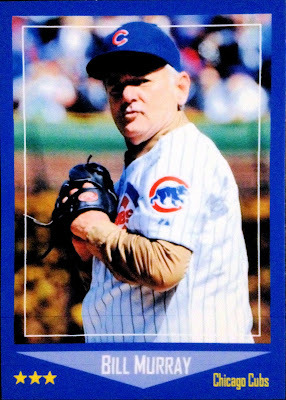 In summation, this surprise PWE contained two sweet parallels, my first football autographs, a collegiate Kris Bryant, Bill Murray's first Cubs cards, and a Ron Santo 1/1 magnet delivered by way of a rip card. In the immortal words of one Harry Christopher Carabina, aka Harry Caray, "Holy Cow!" Also, I believe this extends your streak of blog roll appearances with the "Holiday Blast" to four days in a row. We're past halfway with your goal of one, full week. Glad you like! That was a fun one to put together, for sure. 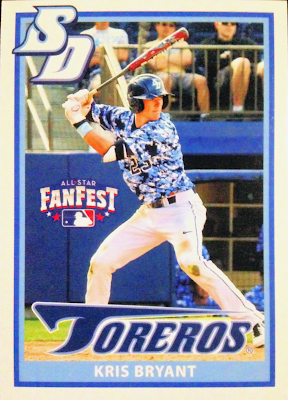 I liked that USD Toreros Bryant card so much, I ended up picking up a good-priced lot so I could spread them around and remind people of his San Diego ties.. haha.